We listen first to discover, clarify, and understand your values and objectives, both short and long-term. Then together, following a life planning approach, we work with you to develop and implement an initial strategy to accomplish your goals in a way that is consistent with your values. Together over time, we will modify your strategy to fit your changing needs and the changing world around us. We remain committed to you, today and tomorrow, as your needs and objectives evolve. A financial strategy is not a static plan. As you move through life, the complexity of your needs may change. Today you may need basic protection and guidance. As the years pass, it may be business planning or financial independence . You may have specific objectives, business transitions, financial gifts or legacies that are important. Together we will address all of your needs. Our process begins with Insight Builder™, an in-depth conversation that allows you to assess whether there is a good fit between your needs and our capabilities. We look at your life and what is important to you – past, present and future. Though there is no charge for this initial consultation, we believe this process provides clarity to help you understand your overall picture. If we agree to work together under a Financial Planning Agreement, we will collect the details of your financial life. We address your concerns, your goals and dreams, charting a course to help you get from where you are today to where you want to be in the future. 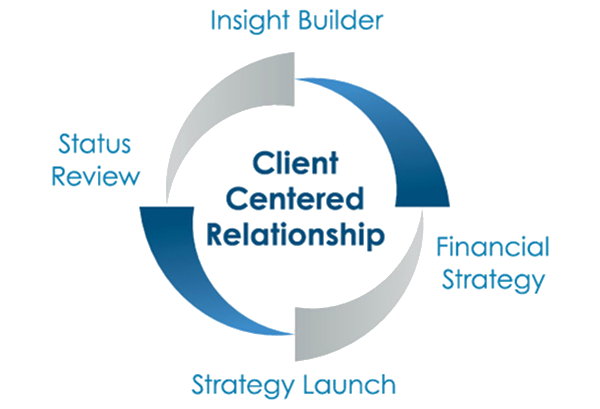 Drawing from what we learn in the process, we produce and present a personalized Client Centered Financial Strategy™. We include a checklist of recommended actions. At the Strategy Launch™, we implement the steps we have agreed to take immediately. These may involve adjusting existing arrangements, conferring with your attorney or tax advisor, or putting new financial products or services in place. Though we are available to you throughout the year, once a year we are committed to a formal Systematic Status Review™. We review your situation to learn what is new, and what has changed in your life. We discuss the status of our ongoing projects together to ensure they are continuing to meet your needs.